Described and named by W. H. Edwards from an Illinois specimen, this species was also quite familiar to Scudder, who was able to cite a surprising number of nineteenth-century New England and Massachusetts specimens. Since 1900 Common Roadside-Skipper appears to have drastically declined in both Massachusetts and Connecticut (Table 2). It is more easily found, though still uncommon, in Maine and eastern Vermont. It may have withdrawn northward due to climate warming. Scudder wrote “It has been found throughout almost the whole of New England, though far more abundant in the southern than in the northern half, but in the north it occurs at Hallowell, Me. (Miss Wadsworth), and in the White Mountains (Morrison, Scudder). It has also been found in other hilly parts of New Hampshire and Massachusetts....” He cites Massachusetts specimens from Amherst (where it was “common” according to Parker and Morrison), Mount Toby (7/11/1885, F. H. Sprague, specimen in MCZ), Springfield,, and “about Boston”; he also says it “is common enough in Connecticut,” citing four collectors (1889:1585-6). Most of the grass skippers probably increased as a result of the widespread land clearing which began after 1600 (Table 1), but Common Roadside-Skipper may have increased more than others. The Harvard MCZ has at least 30 historical (pre-1950) Massachusetts specimens, more than for many other common skippers. The species was not rare. Collector F. H. Sprague did not find it in his usual haunts around Wollaston and Milton near Boston, but he amassed many specimens from Princeton, MA in 1888, 1890, and 1897 (MCZ). The earliest extant specimen seems to be one from Newton, by Roland Thaxter, dated 1877 (MCZ). For the twentieth century, C. W. Johnson's 1914 or 1917 specimen from Rutland in Worcester County is at Boston University, and C. V. Blackburn's 6/11/1924 Middlesex County [probably Stoneham] specimen is at Furman University. At the MCZ are 1920's specimens from Weston (C. J. Paine) and Tyngsboro (H. C. Fall), a 1937 specimen from Lincoln, a 1940 specimen from Greenfield, and a series of 10 specimens from Wellesley taken in 1930. V. Nabokov also found it in Wellesley in 1942. By the 1930’s Farquhar (1934) noted that Common Roadside-Skipper was still found "throughout New England" but was “curiously rare in some localities.” In particular, Common Roadside-Skipper was not known on Martha's Vineyard or Nantucket in the 1930's or 1940's (Jones and Kimball 1943). From the 1960's and 1970's, there are still a number of museum specimens. Between 1960 and 1966 C. G. Oliver found a total of 11 specimens in the towns of Acton and Belmont (Yale). William D. Winter found specimens of Common Roadside-Skipper in Millis in 1966 and 1967, in Westwood in 1969, and in Dover in 1973 ( MCZ). L. F. Gall found a specimen in Dover in 1983 (Yale). Common Roadside-Skipper often takes minerals and moisture from bare soil areas, such as roadsides; hence its long-standing common name. In the same large genus as Pepper and Salt Skipper, it has a similar but much wider range, extending all the way to the west coast and well into Canada, and through the southeastern United States south to north Georgia, although at higher elevations and inland, not on the lowland coastal plain (BAMONA 2010; Layberry 1998). It is scarce or at least not abundant anywhere in its east coast range. Today it is more common in northern New England than southern -- a reversal of the distribution described by Scudder. It is found throughout Maine except in the far north (MBS 2012), in eastern Vermont, where it is “common to uncommon” (VBS 2002-2007), and throughout New Hampshire except for a few counties (BAMONA 2010). Like the Pepper and Salt Skipper, Common Roadside is at the southern limit of its New England range in Massachusetts and Connecticut, and hence vulnerable. Common Roadside-Skipper’s host grasses are similar to those of Pepper and Salt Skipper: river oats (Chasmanthium [Uniola] latifolia), Kentucky bluegrass (Poa pratensis), wild oats (Avena spp. ), bentgrass (Agrostis spp. ), and Bermuda grass (Cynodon dactylon) (Scott 1986; Opler and Krizek 1984). The larvae eat many grasses in the lab. The Connecticut Atlas raised it on Kentucky bluegrass; Scudder reported egg-laying on Avena striata and young larvae accepting Kentucky bluegrass (1889: 1587). The exact host plants today in Massachusetts are undetermined. This skipper is usually classed as a forest understory species (Schweitzer, Minno, Wagner 2011:52). Cech (2005) reports that it is most reliably found in dry barrens locations, but also regularly found in clearing and edges of moist, deciduous woodlands. It may be negatively impacted by deer browse. Scudder cites mostly upland, rather than coastal plain areas, and Map 110 suggests such a distribution today. In Massachusetts, several sightings have been on mountains, such as Mt. Greylock (see photo above), Mt. Tom, and Mt. Holyoke. The 1985-90 Atlas ranked Common Roadside-Skipper as rare in our state, confirmed in only 10 out of 723 blocs. MBC 2000-2007 records confirm that it is still Rare, about on a par with Dion Skipper and Two-spotted Skipper (Table 5). It is less common than its congener the Pepper and Salt Skipper, which is ranked Uncommon. Judging from museum specimens and Scudder’s account, Common Roadside has declined since the nineteenth century in Massachusetts. The species is also Rare in Connecticut, and was recently given State Threatened status. 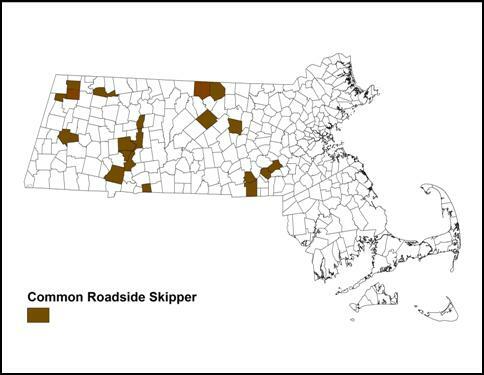 The Connecticut Atlas noted that Common Roadside-Skipper was “at southern limit of range, formerly widespread, declining regionally” (O’Donnell, Gall, Wagner 2007: 292, Table 6.2). Common Roadside-Skipper has been seen in small numbers in 14 of the 22 years 1992-2013 (Chart 110). The highest numbers reported in any one year are five in 1998, 2000 and 2001. In these years, the skipper was reported not only from the small colony at Sunderland quarry (see below), but also from Northampton Florence, Mt. Tom, Mt. Holyoke, Westfield, Hubbardston Barre Falls Dam, and Milford power line. There have been very few sightings since the peak years of 1998-2001. The single 2009 report was 6/2/2009 at Holliston Brentwood CA, B. Bowker. 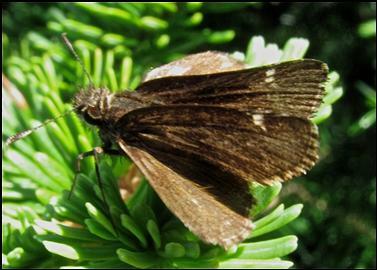 On June 4, 2010, visiting butterfly enthusiasts Tom Fiore and Kristine Wallstrom saw a Common Roadside-Skipper on the summit of Mount Greylock and were able to get a photograph (see above); that was the sole report that year. In 2011and 2013 there were no reports; in 2012 one was reported on 6/9 from Winchendon, B. Cassie. C. Kamp was unable to locate it the next day, but that is not uncommon with this skipper. The trend appears to be downward for this skipper in this state, although more evidence is needed. The Breed et al. list-length study (2012) did not include this species due to the small number of reports. Common Roadside-Skipper was reported from 20 of a possible 351 towns (Map 110). Pepper and Salt Skipper, by contrast, was reported from 64 towns in this period. Common Roadside-Skipper is similar to Pepper and Salt Skipper in its absence from the southeast coastal plain. The 1986-90 MAS Atlas found it absent from southeastern areas, the Cape, and islands, and BOM-MBC records confirm this. Mello and Hanson 2004 do not report it for the Cape; Pelikan (2002) does not list it for Martha’s Vineyard. BAMONA does not show any records for these areas. Common Roadside Skipper also appears to be absent from Essex County and most of eastern Massachusetts, according to both Atlas and BOM-MBC records. The eastern-most town shown on the map is Holliston; there is also a report from nearby Milford power line. The Atlas had records from just slightly further east, from Chelmsford, Concord, and Sherborn, but none from Essex County. BOM-MBC records have added more sighting locations in the Connecticut River valley and in northwestern Massachusetts. In "the valley," a small colony in a quarry in Sunderland, from which 1 to 2 were reported each year 1998-2001 by D. Case and T. Gagnon, was apparently extirpated when the quarry was expanded (Benner 2010). Whereas the Atlas had one Berkshire report, in Washington (5/24/1989 E. Neumuth), recent records have added another Washington sighting (6/18/1996 R. Forster), as well as several Mt. Greylock reports (6/12/2004 M. Lynch and S. Carroll; 6/4/2010 T. Fiore; Northern Berkshire Count 7/12/1995); and a report from Charlemont (6/16/1995 (D. Potter). Other locations include Northbridge 6/5/1994 R. Hildreth; Northampton Florence 5/31/2004 T. Gagnon; Ashburnham 6/9/1995 R. Walton; Easthampton Mt. Tom State Reservation 4/30/1999 T. Dodd and C. Asselin; Westfield 5/31/1999 T. Gagnon; Mt. Holyoke 6/24/2000 T. Gagnon, D. Case; Uxbridge 2003 R. Holden; Hubbardston Barre Falls Dam 6/16/2001 M. Lynch and S. Carroll; Holliston Brentwood CA 6/2/2009 B. Bowker; East Longmeadow 6/13/2005 K. Parker. The largest number reported from any one area is 4 in Northbridge in 1994; all other reports are of 1 or 2 in a location. NOTE TO COLLECTORS: THIS IS A RARE AND POSSIBLY DECLINING SPECIES IN MASSACHUSETTS. IT SHOULD NOT BE COLLECTED EXCEPT AS PART OF SCIENTIFIC RESEARCH UNDER INSTITUTIONAL AUSPICES. Common Roadside-Skipper has only one brood in our area, so far as we know, but two in southern states. It is apparently univoltine in central New York as well (Shapiro 1974; Forbes 1960), and in New Jersey (Gochfeld and Burger 1997). It is double-brooded in Georgia (Harris 1972) and in West Virginia (Allen 1997), where its second flight is July-August. In Massachusetts all 1992-2013 sightings were between May and mid-July, except for one August report (http://www.naba.org/chapters/nabambc/flight-dates-chart.asp). Sightings were most frequent in the last week in May, tapering off through June. Earliest sightings: In 22 years of BOM-MBC records 1992-2013, the three earliest "first sightings" are 5/2/2000 Sunderland, D. Case; 5/11/1999 Sunderland, D. Case; and 5/16/1998 Sunderland, D. Case. The earliest three sightings coincide with the “high-abundance” years, and are from the now-extirpated quarry colony in Sunderland. These dates are a bit earlier than those of Scudder, who mentions the “latter part of May” as the usual appearance time, though sometimes delayed until the first of June (1889:1587), and earlier than Farquhar, who notes “last of May through July” (1934: 285). Latest sightings: The last sightings are two mid-July reports and one August report. Given the difficulty of identifying this rarely-seen skipper, more late reports, preferably with photographs, are needed before determining the end of the flight period. Many authorities believe this skipper is declining in the mid-Atlantic and southern New England, although it appears more secure further west and north. NatureServe (2014) says vialis “has become quite rare in the mid-Atlantic region...and southern New England and the causes are not known.” As of 2014, Common Roadside-Skipper is ranked by NatureServe as S1 or “critically imperiled" in Massachusetts, Rhode Island, and Connecticut, and S2 in New Jersey and Pennsylvania. Rhode Island has several historical, but only two recent, records (Benner 2010). Connecticut has given this species State-Threatened status. There was only one record found during the 1990-95 Connecticut Atlas, compared to 17 pre-project records. The reasons for the decline are unknown, but may have to do with climate warming. Given this species’ higher-elevation distribution, and univoltine brood status at our latitude, it is probably vulnerable to climate warming trends. It could retreat to higher and more northern locations if climate warms (Table 6). It would appear that Common Roadside Skipper has declined in Massachusetts since the nineteenth century, and current citizen-observer data suggest a further downward slide. BOM believes this species warrants state-listing today. The disappearance of the skipper from the Sunderland quarry might have been prevented through state listing. BOM lists it here as a Species of Conservation Concern.